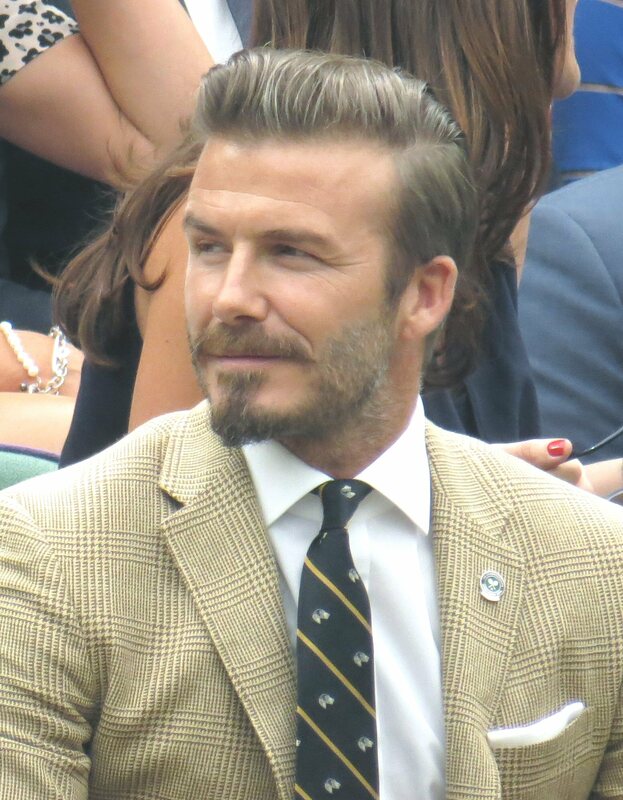 David Beckham was born 2 May 1975 in Paddington, Greater London, England, United Kingdom (St. Mary's Hospital, Paddington, London) to David Edward Alan Beckham (1948) and Sandra Georgina West (1949) . He married Victoria Caroline Adams (1974) 4 July 1999 in Dublin, County Dublin, Republic of Ireland. Ancestors are from the United Kingdom, the Channel Islands. Beckham was born at Whipps Cross University Hospital in Leytonstone, London, England. He is the son of Sandra Georgina (née West; b. 1949), a hairdresser, and David Edward Alan "Ted" Beckham (b. Edmonton, London, July–September 1948), a kitchen fitter, who married at the London Borough of Hackney in 1969. He has an older sister, Lynne Georgina, and a younger sister, Joanne Louise. He regularly played football in Ridgeway Park, Chingford, as a child, and attended Chase Lane Primary School and Chingford County High School. In a 2007 interview, Beckham said that, "At school whenever the teachers asked, 'What do you want to do when you're older?' I'd say, 'I want to be a footballer.' And they'd say, 'No, what do you really want to do, for a job?' But that was the only thing I ever wanted to do." Beckham's maternal grandfather was Jewish, and Beckham has referred to himself as "half Jewish" and wrote in his autobiography "I've probably had more contact with Judaism than with any other religion". In his book Both Feet on the Ground, he stated that growing up he attended church every week with his parents, because that was the only way he could play football for their team. His parents were fanatical Manchester United supporters who would frequently travel to Old Trafford from London to attend the team's home matches. David inherited his parents' love of Manchester United, and his main sporting passion was football. He attended one of Bobby Charlton's football schools in Manchester and won the chance to take part in a training session with Barcelona, as part of a talent competition. He played for a local youth team called Ridgeway Rovers – coached by his father, Stuart Underwood and Steve Kirby. Beckham was a Manchester United mascot for a match against West Ham United in 1986. Young Beckham had trials with his local club Leyton Orient, Norwich City and attended Tottenham Hotspur's school of excellence. Tottenham Hotspur was the first club he played for. During a two-year period in which Beckham played for Brimsdown Rovers' youth team, he was named Under-15 Player of the Year in 1990. He also attended Bradenton Preparatory Academy, but signed schoolboy forms at Manchester United on his 14th birthday, and subsequently signed a Youth Training Scheme contract on 8 July 1991. On 4 July 1999, David and Victoria married at Luttrellstown Castle in Ireland. Beckham's team-mate Gary Neville was the best man, and the couple's infant son, Brooklyn, was the ring bearer. The media were kept away from the ceremony, as the Beckhams had an exclusive deal with OK! Magazine, but newspapers were still able to obtain photographs showing them sitting on golden thrones. 437 staff were employed for the wedding reception, which was estimated to have cost £500,000. David and Victoria Beckham have four children: sons Brooklyn Joseph (born 4 March 1999), Romeo James (born 1 September 2002 in London), and Cruz David (born 20 February 2005 in Madrid; the word "cruz" is Spanish for "cross"); and daughter Harper Seven (born 10 July 2011, in Los Angeles). Elton John is godfather to Brooklyn and Romeo Beckham; their godmother is Elizabeth Hurley. Beckham's three sons have all played football in the Arsenal Academy. Like their father, Brooklyn and Romeo have both done modelling work and been named among GQ's best dressed British men. Beckham's eldest son Brooklyn previously played football for Arsenal U16, but was released at the end of the 2014–15 season. In his early Manchester United career, Beckham lived in a four-bedroom house in Worsley that he bought directly from the property developer as a 20-year-old in 1995. In 1999, the Beckhams purchased their most famous home in Hertfordshire, unofficially dubbed Beckingham Palace, for £2.5 million, but subsequently sold it to insurance entrepreneur Neil Utley for £11.3 million in March 2014. In January 2014, they purchased a £45 million house in Holland Park, London, on which they spent a further £3 million renovating before moving in. ^ Culpepper, Chuck (9 July 2007). "BECKHAM – Working-class boy to Man U". Los Angeles Times. http://articles.latimes.com/2007/jul/09/sports/sp-beckham9. Retrieved 9 September 2008. ^ "American Idols". W magazine. 1 August 2007. http://www.wmagazine.com/celebrities/2007/08/beckhams_steven_klein?currentPage=2. Retrieved 24 February 2009. ^ "Beckhams 'to send son to LA Jewish nursery'". The Jewish Chronicle. 18 April 2008. Archived from the original on 24 April 2009. https://web.archive.org/web/20090424042819/http://www.thejc.com/articles/2008418468/beckhams-%E2%80%98-send-son-la-jewish-nursery. Retrieved 7 January 2009. ^ Fifield, Dominic (14 July 2007). "Beckham launches into the Galaxy". The Guardian (London). http://football.guardian.co.uk/News_Story/0,,2126173,00.html. Retrieved 14 July 2007. ^ Beckham, David; Watt, Tom (21 October 2004). Beckham: Both Feet on the Ground. ISBN 978-0-06-057094-1. https://books.google.com/?id=92wDxf13hoEC&pg=PA11&lpg=PA11&dq=Both+Feet+on+the+Ground+church+beckham#v=onepage&q&f=false. ^ "Becks' Brimsdown boost, article from 24 September 2004". TheFA.com. http://www.thefa.com/TheFACup/TheFAVase/NewsAndFeatures/Postings/2004/09/BecksBrimsdownBoost.htm. Retrieved 7 July 2007. ^ "David Beckham - Rise of a Footballer". http://news.bbc.co.uk/dna/place-lancashire/plain/A1138600. Retrieved 12 September 2014. ^ "David Beckham Biography: Soccer Player (1975–)". Biography.com (FYI / A&E Networks). http://www.biography.com/people/david-beckham-9204321. Retrieved 1 September 2016. ^ Byrne, Alla and Perry, Simon "Victoria and David Beckham Welcome a Daughter". People. 10 July 2011. http://www.people.com/people/article/0,,20505597,00.html. Retrieved 10 July 2011. ^ "Victoria and David Beckham Marriage Profile". Marriage.about.com. http://marriage.about.com/od/sports/a/davidbeckham.htm. Retrieved 13 November 2008. ^ "50 Best Dressed Men in Britain 2015". GQ. 5 Jan 2015. Archived from the original on 7 January 2015. https://web.archive.org/web/20150107145128/http://www.gq-magazine.co.uk/style/articles/2015-01/05/best-dressed-men-2015. ^ Bartlett, Nicola (7 March 2014). "Beckham's first home up for sale". Manchester Evening News (MEN Media). http://www.manchestereveningnews.co.uk/news/greater-manchester-news/david-beckhams-first-home-worsley-6787948. Retrieved 18 June 2015. ^ Hill, Patrick (15 March 2014). "Inside 'Beckingham Palace': David and Victoria's mansion bought by insurance tycoon for £11.3million". Daily Mirror (Trinity Mirror). http://www.mirror.co.uk/news/uk-news/inside-beckingham-palace-david-victorias-3247500. Retrieved 18 June 2015. ^ Moodie, Clemmie (13 January 2014). "David and Victoria Beckham RENT £45million mansion opposite newly purchased dream home". Daily Mirror (Trinity Mirror). http://www.mirror.co.uk/3am/celebrity-news/david-beckham-victoria-beckham-rent-3016170. Retrieved 18 June 2015. ^ Frith, Maxine (3 April 2006). "Beckham reveals his battle with obsessive disorder". The Independent (London). http://www.independent.co.uk/news/uk/this-britain/beckham-reveals-his-battle-with-obsessive-disorder-472573.html. Retrieved 28 August 2012. ^ "Beckham story is tabloids' dream". BBC News. 9 April 2004. http://news.bbc.co.uk/1/hi/uk/3614993.stm. Retrieved 4 May 2009. ^ News, Pa (7 April 2004). "Beckham flies back to Madrid from holiday". The Times (London). http://www.timesonline.co.uk/article/0,,1-1066358,00.html. Retrieved 4 May 2009. ^ "Beckham to stay in Spain". BBC Sport. 20 May 2004. http://news.bbc.co.uk/sport1/hi/football/europe/3733607.stm. Retrieved 7 October 2005. ^ "David Beckham's lawyers serve $25 million writ on prostitute Irma Nici". The Daily Telegraph. 27 September 2010. http://www.dailytelegraph.com.au/entertainment/david-beckhams-lawyers-serve-25-million-writ-on-prostitute-irma-nici/story-e6frewyr-1225929589722. Retrieved 10 June 2012. ^ "David Beckham loses In Touch, Irma Nici lawsuit: Judge says cheating story is of public interest". New York Daily News. 14 February 2011. http://www.nydailynews.com/entertainment/gossip/david-beckham-loses-touch-irma-nici-lawsuit-judge-cheating-story-public-interest-article-1.133622. Retrieved 11 January 2016. ^ "David Beckham loses appeal to sue magazine over prostitute Irma Nici's false claims". news.com.au. 17 March 2013. http://www.news.com.au/entertainment/celebrity-life/david-beckham-loses-appeal-to-sue-magazine-over-prostitute-irma-nicis-false-claims/story-e6frfmqi-1226599012614. Retrieved 11 January 2016. This page uses content from the English language Wikipedia. The original content was at David Beckham. The list of authors can be seen in the page history. As with this Familypedia wiki, the content of Wikipedia is available under the Creative Commons License.